Sens. 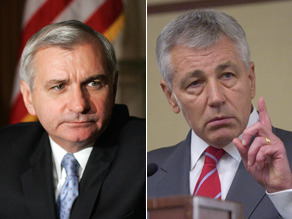 Reed and Hagel will accompany Obama on a trip to Iraq. WASHINGTON (CNN) - Sen. Barack Obama is heading to Iraq later this month with two Senate colleagues, Republican Chuck Hagel and Democrat Jack Reed, according to two sources familiar with the presumptive Democratic presidential nominee's plans. The sources said the official Congressional delegation trip, known as a CODEL, will occur around the time Obama heads overseas for a previously-announced campaign trip to France, Germany, Great Britain, Israel, and Jordan to help beef up his foreign policy credentials. Officials are keeping the precise dates of Obama's trip under wraps, however, for obvious security reasons. The inclusion of Hagel on the official portion of the trip is guaranteed to further fuel speculation that Obama might pick a Republican as a running mate on a presidential ticket aimed at winning over independents. Hagel, who privately discusses foreign policy matters with both Obama and Republican presumptive presidential nominee John McCain, has publicly left the door open to a possible bipartisan ticket. Watch: Hagel as Obama's VP? Aides to Hagel and Reed both refused to comment when asked by CNN about the upcoming trip. The Nebraska Republican could also be a contender for a Cabinet post like Defense Secretary if either Obama or McCain wins, according to strategists in both parties, because of his friendship with both candidates. Reed, a Democrat from Rhode Island, is an Army veteran who is respected in both parties for his knowledge of national security issues. Democratic strategists privately say Reed is highly-regarded by Obama and could also find himself on the short list for a variety of posts in a potential Democratic administration. There has been speculation that the delegation may also stop in Afghanistan, but sources familiar with the trip would not confirm the possibility of a second stop. I could easily see Hagel as a future Secretary of State, but I think Obama might consider an opposite-party VP to be a gimmick. Still, anything to help this country heal and find its soul again after George W.
Obama/Hagel would be a great ticket. I'm a liberal but ever since 2003 Hagel has had a buzz around him for a leadership position. His stance against Bush despite the GOP partisanship of the last 10 years. What ever happened to the United States of America as opposed to the civil war between reps and dems? Its about time someone is uniting this country. 2 heads are always better than one ignorant one.